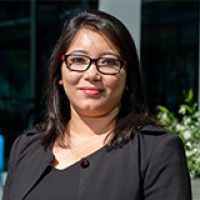 AUT is a marvellous melting pot, says business alumna Meghana Lama who came to AUT as an international student from India to study a Master of Business. “AUT has students of different ages, abilities, ethnicities, backgrounds and worldviews. Peer learning is therefore fabulous, and the exchange of different ideas contributes to the overall learning process. Meghana enrolled in AUT’s Master of Business after a successful career in human resources. For her master’s research, she focused on the early work experiences of skilled Indian migrants in New Zealand. “Indians have been one of the fastest growing ethnic communities in New Zealand over the last few years, and the bulk of Indian immigrants falls in the skilled professional category. Given that the workforce in New Zealand is multi-ethnic and that Indians form a sizeable portion of this workforce, my study aimed to understand the challenges faced by this group. After graduating from AUT in August 2018, Meghana now works as a human resource analyst at Auckland Transport. There are many things she loves about her work, Meghana says.